What: "Copy a Disc" can be used to copy any CD, DVD, or BDR master. This job type reads the master disc from the Disc Publisher drive to the hard drive of your computer. The master is stored in the Discribe Image format (*.dmg) in a temporary location on your computer. Discribe uses this temporary file to make all subsequent copies that are requested. The master disc is read only once to create the initial temporary file. Recommended for: All CD, DVD or BDR types (Audio CD, Data CD, Software Install Disc, Video CD, DVD Video, etc.). This is best used for single runs where you will not need to make additional copies of the master disc at a later time. 1. Select Copy a Disc from the job menu bar. Select the location of the master using the drop down menu. 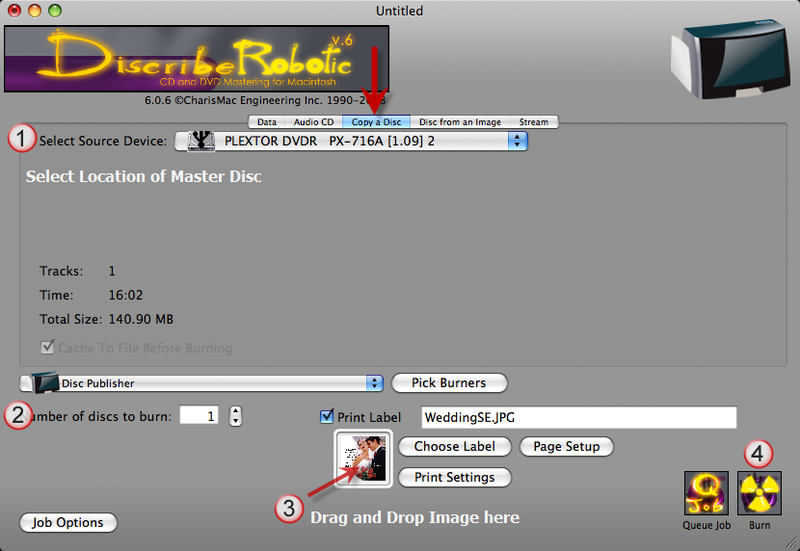 Primera recommends placing the master disc into a drive in your Disc Publisher.